I was asked to create the first illustrated cover for Edible Baja Arizona, a bimonthly journal devoted to the foodways of the Sonoran Desert region. Other illustration assignments ensued, including artwork for articles written by MacArthur Fellow, Gary Nabhan. 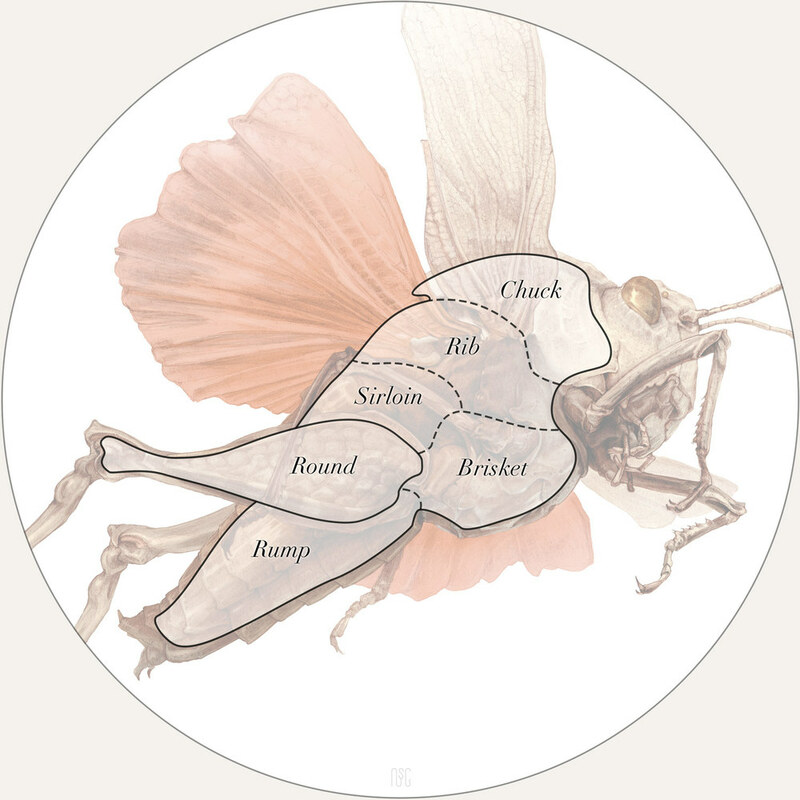 This Oak Leaf Grasshopper cover was paired with the butcher's diagram below for Norah Booth's article on edible insects. Insect reference was gathered at the University of Arizona Insect Collection. Graphite and digital media, 2014. Critic's Choice for Best Illustration across 80+ regional magazines in the Edible Community. "'Wow.' That's the first thing I said as my eyes locked on these beguiling illustrations of bees, masterfully crafted by Robert J. Long. They're seamless companions to Gary Paul Nabhan's important must-read story about bee recovery, but they're works of art all by themselves. Get these hung in a gallery, stat! A feast for the eyes indeed." "...[S]urgically concise, but there is nothing cold and humorless about it... we see how the bee’s little limbs are shaped to do everything from compress pollen to groom his eyebrows, while a carpenter bee, in a canvas apron with carpenter’s tools, stares at us resolutely... Thought provoking in word and image = success. I’ll frame these. Note: If a special award were given for a piece that presents a perfect whole, from what I have seen this would be my choice. It’s smart, info-packed, wonderfully illustrated and utterly readable. Everything an Edible story should be." Honey, Don't Forget the Pollinators: the Pivotal Role of Baja Arizona Foodscapes in Bee and Butterfly Recovery, written by Gary Nabhan. Nomadic Nurseries, Guerilla Grafters, and SNAP Seed Sowers, written by Gary Nabhan. Sept/Oct 2013 issue. This Sopita is Haunted, written by Gwendoline Hernandez. May/June 2014 issue.